Whether you’ve just returned from a day on the ski slopes or you’ve spent the day by the fire with book in hand, a bowl of this dish is sure to warm the depths of your soul. We brown ground beef and not one but two kinds of mushrooms for this meal. Then we throw in everything that makes for a good stew: barley, carrots, celery and onion, garlic and some demi-glace for good measure. 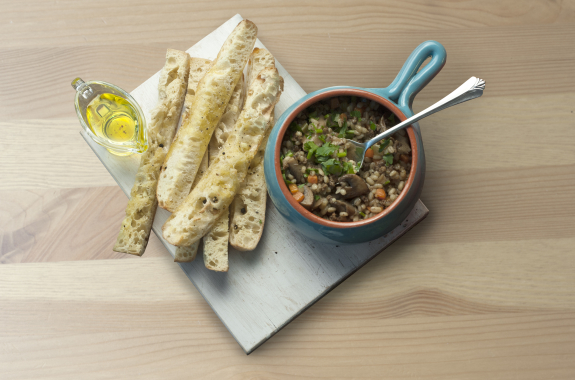 We let everything simmer while we toss strips of ciabatta with a drizzle of oil and garlic to make the perfect toasted breadsticks. Break off a piece to mop up every last bit of this thick and hearty stew! In a medium pot, heat a drizzle of oil on medium-high. Add the ground beef*; season with S&P. 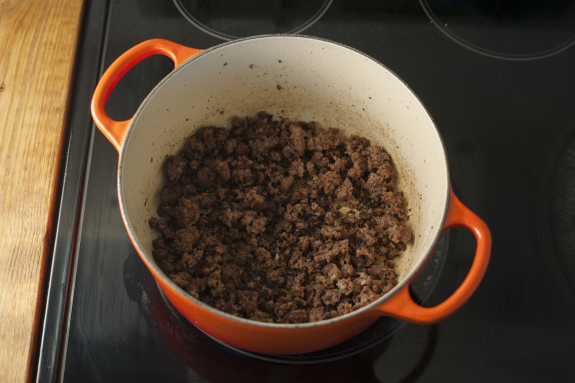 Cook, breaking the meat up with a spoon, 8 to 10 minutes, until deeply browned and cooked through; season with S&P. Transfer to a bowl and set aside. Reserve the pot. While the beef cooks, preheat the oven to 450°F. In a small pot (or kettle), bring 1 cup of water to a boil (double for 4 portions). 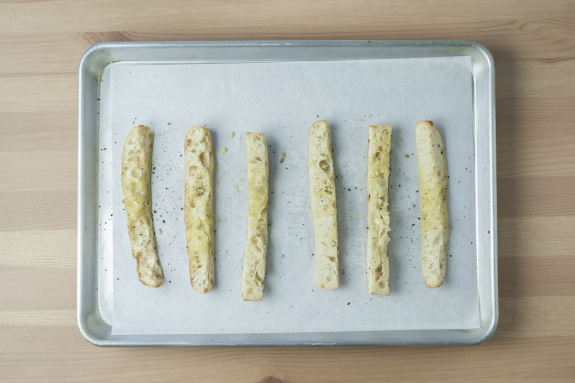 Halve the ciabatta lengthwise; cut each half into 3 equal strips. Quarter the cremini mushrooms. Peel the carrots; small dice with the celery. Peel, halve and small dice the onion; combine with the carrots and celery. Mince the garlic. Roughly chop the parsley leaves and stems. 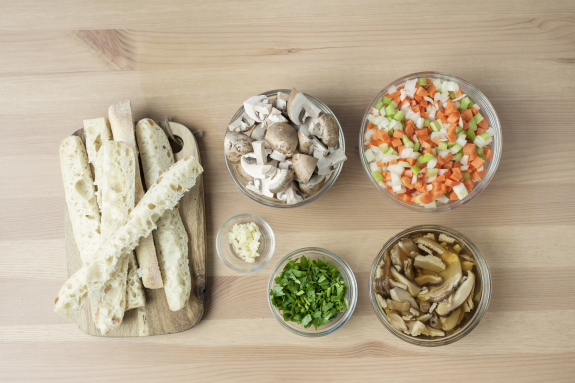 In a bowl, combine the dried shiitake mushrooms with the boiling water; let stand for at least 10 minutes. In the reserved pot, heat a drizzle of oil on medium. 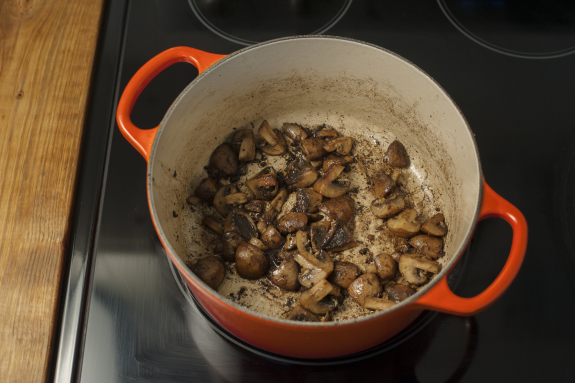 Add the cremini mushrooms and cook, stirring occasionally, 3 to 5 minutes, until beginning to brown; season with S&P to taste. Add ½ the vinegar and ¼ cup of water. Cook, scraping the browned bits (or fond) from the bottom of the pan, 30 seconds to 1 minute, until slightly reduced. Transfer to the bowl of beef and set aside. In the same pot, heat a drizzle of oil on medium-high. Add the carrots, celery, onion and ½ the garlic. Cook, stirring frequently, 2 to 3 minutes, until the onions begin to soften; season with S&P. Add the cooked beef, cremini mushrooms, barley, shiitake mushrooms (with the soaking liquid), demi-glace and 2 cups of water (double for 4 portions); season with S&P. 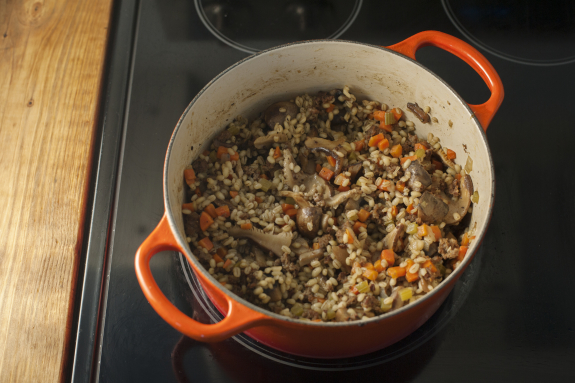 Bring to a boil; reduce to a simmer and cook, 15 to 20 minutes, until the barley is al dente. Add 1 cup of water (double for 4 portions); and cook, 2 to 4 minutes, until the barley is cooked through; season with S&P to taste. While the stew cooks, on a lined sheet pan, toss the bread strips with a drizzle of oil and the remaining garlic; season with S&P. Arrange in a single, even layer and toast, turning halfway through, 4 to 6 minutes, until golden brown. To the pot of stew, add as much of the remaining vinegar as you’d like and ½ the parsley; season with S&P to taste. Stir to combine. Divide the finished stew between your bowls. Garnish with the remaining parsley and a drizzle of olive oil. Serve the bread sticks on the side. Bon appétit! Health Canada recommends cooking beef to a minimum internal temperature of 63°C.